The field of metamaterials has produced structures with unprecedented abilities, including flat lenses, invisibility cloaks and even optical "metatronic" devices that can manipulate light in the way electronic circuitry manipulates the flow of electrons. Now, the birthplace of the digital computer, ENIAC, is using this technology in the rebirth of analog computing. 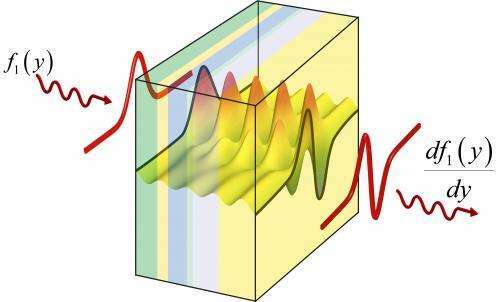 A study by researchers at the University of Pennsylvania, The University of Texas at Austin and University of Sannio in Italy, shows that metamaterials can be designed to do "photonic calculus" as a light wave goes through them. A light wave, when described in terms of space and time, has a profile in space that can be thought of as a curve on a Cartesian plane. The researchers' theoretical material can perform a specific mathematical operation on that wave's profile, such as finding its first or second derivative, as the light wave passes through the material. Essentially, shining a light wave on one side of such a material would result in that wave profile's derivative exiting the other side. Metamaterials capable of other calculus operations, such as integration and convolution, could also be produced. Viewing and manipulating this type of light wave "profile" is an everyday occurrence for applications like image processing, though it is typically done after the light wave has been converted to electronic signals in the form of digital information. The researchers' proposed computational metamaterials could almost instantly perform such operations on the original wave, such as the light coming in through the lens of a camera, without conversion to electronic signals. 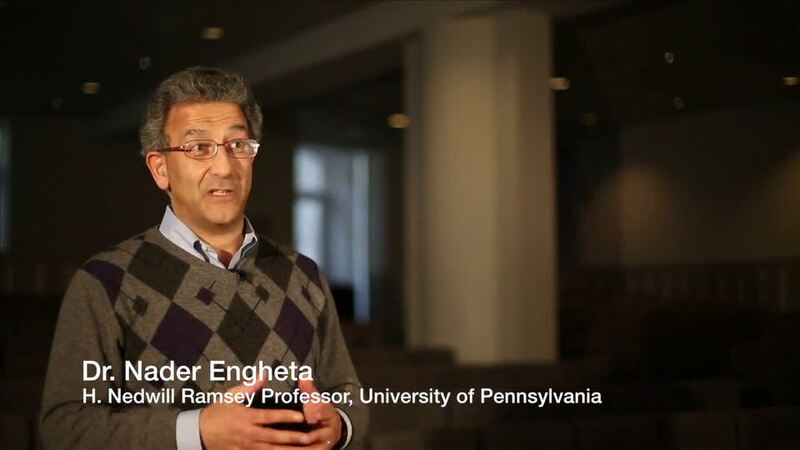 The study was led by Nader Engheta, the H. Nedwill Ramsey professor of Electrical and Systems Engineering in Penn's School of Engineering and Applied Science, and Alexandre Silva, a postdoctoral researcher in Engheta's research group. They collaborated with Francesco Monticone and Andrea Alù of The University of Texas at Austin and Giuseppe Castaldi and Vincenzo Galdi of the University of Sannio in Italy. The researchers' theory has its roots in analog computing. The predecessors of modern computers were mechanical calculators, which used physical elements, ranging from sliding rulers to complex arrays of gears and drive shafts, to represent, store and manipulate numerical information. In the most complicated examples, a user might set the starting values to be computed on a wheel or dial, and then crank a handle a certain number of times. Intervening sets of gears transformed the starting values in a step-wise fashion until the results were produced. In the mid-20th century, electronic analog computers replaced the mechanical ones, with series of resistors, capacitors, inductors and amplifiers taking the place of gears and drive shafts. Starting values were represented by electric voltage and current, and the results could be read out from the changes in voltage and current after passing through these dedicated circuits. Both mechanical and electronic analog computers were particularly suited to calculating large tables of information. Where the paper-and-pencil method would require tedious and repetitious steps performed on each of the table's elements, with each step prone to human error, analog computers could perform those steps in parallel, producing the results all at once. The advent of the first all-purpose, digital computer—Penn's ENIAC—was revolutionary; abstracting the input data allowed digital computers to be multi-purposed. They could be reprogramed to perform multiple types of calculations, unlike their purpose-built analog predecessors. Though analog computers still had an advantage in not having to translate, quantize and digitize the information they were calculating, their mechanical and electronic makeup could not compete with the advances in integrated electronic circuits that allowed digital computers to rapidly shrink their footprints and boost their speed. By swapping their mechanical gears and electrical circuits for optical materials that operate on light waves, however, it may once again be analog computers' time to shine, but this time at the micro- and nanoscale. "Compared to digital computers, these analog computers were bulky, power hungry, and slow," Engheta said. "But by applying the concepts behind them to optical metamaterials, one day we might be able to make them at micro- and nanoscale sizes, and operate them at nearly speed of light using little power." "The thickness of our structures can be comparable with the optical wave length or even smaller," said Vincenzo Galdi of the University of Sannio. "Implementing similar operations with conventional optical systems, such as lenses and filters, would require much thicker structures." Metamaterials are composites of natural materials, but are designed in such a way that they manipulate electromagnetic waves in ways that are more than the simple sum of their parts. Objects made from natural materials have atoms and molecules that are arranged in certain patterns dictated by the laws of physics and chemistry. Those patterns give natural materials their electromagnetic properties, which in turn determine how they influence the properties of waves. By going to another layer of organization—making patterns of multiple materials at length scales smaller than the waves passing through them, like a series of nanoscopic gold cubes embedded in glass— metamaterial designers can alter waves in ways not possible by simple surfaces or lenses. For example, a pen sticking out of a glass of water looks bent because the water surface refracts or "bends" the light; light traveling from the pen to the viewer from below the water line has a different angle of refraction than the light traveling from above. Unlike natural materials, however, metamaterials can be designed to produce negative angles of refraction. If the water in the glass exhibits negative refraction, the image of the pen below the water line would not just be bent, but flipped as if viewed in a mirror. Multiple such manipulations can be combined or performed in sequence, allowing metamaterial researchers to change the shape of waves in complex ways. One analog-suited application that might make direct use of such computational metamaterials is edge detection, an increasingly common image processing technique that helps software find faces and identify objects in pictures. "Thanks to recent advances in nanotechnology," said Andrea Alù, Associate Professor and David & Doris Lybarger Endowed Faculty Fellow at The University of Texas at Austin, "today we are able to control light propagation through a material in unprecedented ways, and realize material functionalities that would have been unthinkable only a few years ago. In this paper, we set the stage to have metamaterials realize a broad set of mathematical operations for us on-the-fly, as light propagates through them." More information: "Performing Mathematical Operations with Metamaterials," by	A. Silva et al. Science, 2014.